In their new fall series The New Normal, writers Ryan Murphy and Ali Adler have already created two groundbreaking characters for primetime TV, gay wannabe dads. Now, with tonight's airing of the series' third episode, the writers will be continuing another pioneering tradition which Murphy has long followed with his acclaimed shows: providing work and visibility for the disabled community by featuring actor(s) with Down Syndrome. Back in July at the TV Critics' Association convention in Beverly Hills, I asked Murphy what had inspired him to write a guest-starring spot for actor Blair Williamson on his long-running FX drama Nip/Tuck -- and then to continue to create regular roles for actors with DS on his later shows Glee and American Horror Story. "It certainly made sense [to include characters with DS] for Glee. And it made sense when we were [planning] American Horror Story," Murphy explained. "People ask me that all the time, if I have [Down Syndrome] in my life or if I know somebody. No, but I've always just been very moved by the stories that I've heard, and I like writing those characters." Murphy may be responsible for much of the current trend (which of course famously may have begun with actor Chris Burke's role as Corky on the 1989-93 ABC series Life Goes On), but other producers have tapped into Hollywood's community of actors with DS as well; this past February, Entertainment Weekly profiled prominent actors within the community, including Glee's Lauren Potter, The Secret Life of the American Teenager's Luke Zimmerman, and American Horror Story's Jamie Brewer. 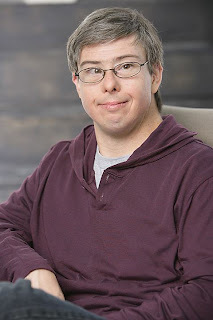 The founder of a group called Down Syndrome in Arts & Media (DSiAM), Blair Williamson's mother Gail works with about 200 aspiring actors nationwide, all while advocating to bring attention to the issues which can particularly affect individuals with DS. 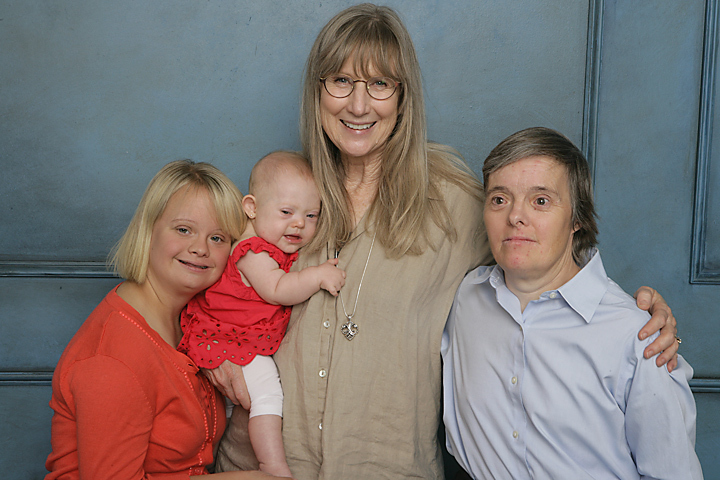 Recently, DSiAM was involved in bringing three Glee actresses together for a photo shoot, both to honor that show's commitment to DS and to bring attention to a health problem to which those with Down Syndrome are prone. Individuals with DS have a high incidence of developing Alzheimer's disease; it's believed this is because an indicator for the disease is located on the triplicate 21st chromosome responsible for DS. Until the death of her character, Sue Sylvester's older sister Jean, actress Robin Trocki appeared on five episodes of Glee. Now at 55, Robin is exhibiting symptoms of Alzheimer's Disease, and her family is coming forward with her story in order to raise funding for medical research. In Glee's first episode this season, there was no mention of Sue Sylvester's new baby having DS, but a beautiful close-up of her new daughter Robin -- named in honor of Robin Trocki -- made it apparent that the baby, played by 8-month-old Jordyn Orr, has the syndrome. And so the photo shoot, featuring Glee's three generations of gals with DS -- Trocki, little Jordyn, and 22-year-old Lauren Potter, aka the deliciously devilish Cheerio/Sue Sylvester henchman Becky Jackson -- was planned, as Gail Williamson explains, "for Robin to meet Jordyn Orr while she still has memory of her work on Glee." "Researchers are hopeful that they will have a vaccine to prevent Alzheimer’s before Lauren Potter reaches the age for symptoms," Williamson says hopefully. "And just think of what kind of medical intervention they may have by the time Jordyn Orr reaches adulthood." I was delighted to hear the dialogue on last night's The New Normal. My son is 36 with Down syndrome, and he began expressing his social opinions in his late teens like everyone else. Not that I encourage him blurting out in public his opinions that are hurtful, that dialogue could have come out of his mouth. I'll never forget when he said, "I'm not handicapped. Handicapped people use wheelchairs silly." Where is Ozzie and Harriett when we need them.